Freedom of the Vale - Faringdon Community Website. 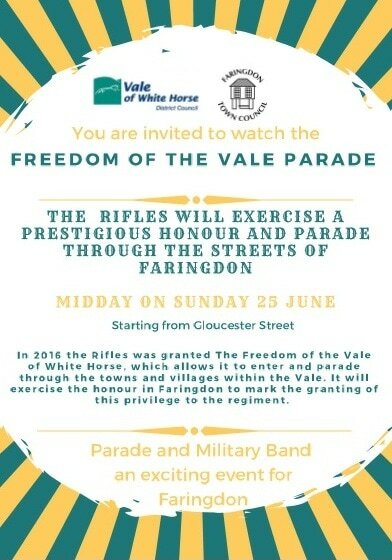 In 2016 the Rifles was granted The Freedom of the Vale of White Horse, which allows it to enter and parade through the towns and villages within the Vale. It exercised the honour in Faringdon to mark the granting of this privilege to the regiment. The Rifles officer commanding the parade officially asked permission to exercise the Freedom before the parade marches up Church St before returning for the Vice Lord Lieutenant to take the salute.